Game could not load – please see above and below for Pimp My Ride games! 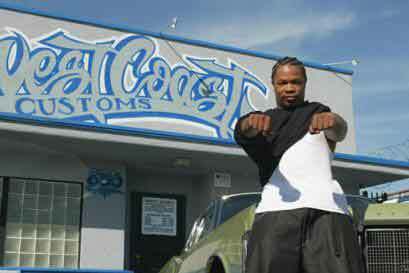 Xzibit and the good people at West Coast Customs make people’s cars go from dirt to pimped in this 30 minute show that airs weekly on MTV. Hosted by Xzibit and featuring Los Angeles-area aftermarket shop West Coast Customs, “MTV Pimp My Ride” selects young, automotively challenged Southern Californians and transforms their rust buckets into triumphs. For many young adults, getting the insurance or finance to fix up their cars can be difficult and taking out a car loan is often not an option. “It’s not just about the cars anymore,” Xzibit said, but also “the boost that these kids get in their self-esteem. You can see it in their faces.” “Everybody has had a bucket in their life,” said Xzibit, using L.A. slang for a clunker. He has had two of his own rides — a Hummer H2 and a Mercedes-Benz S500 — “pimped” at West Coast Customs. 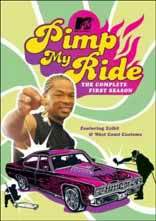 A typical episode begins with Xzibit paying a surprise visit to the viewer and humorously highlighting the car’s numerous problem areas. Then it’s off to West Coast Customs, where a team of professionals disassembles the vehicle and completely refurbishes it with custom rims and paint, plush interiors and the latest in lighting, car audio and video accessories. Wheels, Grilles, Body Kits, Customer Paint, Rims, Tires, Car Audio, Car DVD Video and Computer Systems, and many more crazy additions are transplanted into a Pimped Rides every episode! To qualify for a pimping, you’ll need to be 18-24 years old, and live in the Southern California area. Pimp My Ride – Nominated as Best Reality Program – 9 October, 2007 MTV’s Pimp My Ride has been nominated in the Best Reality Program catagory in the 2007 Environmental Media Association annual awards for their contribution to raise awareness on environmental issues. The 17th awards ceremony will take place on Oct. 24. MTV parks “Pimp My Ride” – No more Pimp My Ride – 19 July, 2007 The upcoming season of MTV’s “Pimp My Ride” will be its last. The network said Wednesday that the auto-centric series, hosted by rapper Xzibit, will return for its final season at 10:30 p.m. Sunday. (The final eight episodes previously aired in a June 9 marathon, a strategy MTV sometimes employs to generate buzz for shows ahead of their regular weekly time-slot premiere.) “Ride” will be paired up with new car-makeover competition series, “Trick It Out,” hosted by former “American Idol” contestant Becky O’Donohue, which debuts at 10 p.m. Sunday. California Governor Arnold Schwarzenegger was so impressed by the biodiesel makeover he took part in on an upcoming environmentally-themed Pimp My Ride show, he insisted mechanics install the same engine under the bonnet of his Hummer. The star and rapper/host Xzibit joined forces to makeover a 1965 Chevy Impala and give the classic vehicle an environmental, biodiesel edge as part of an Earth Day Pimp My Ride. And Schwarzenegger was stunned when Galpin Auto Sports mechanics fitted the classic car with an 800 horsepower biofuel engine, equipped with recycled plastic bottles. He has now asked Galpin boss Beau Boeckman to fit the same engine in his own car. 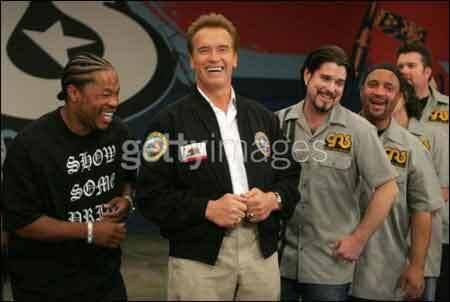 California Governor Arnold Schwarzenegger teamed up with rapper Xzibit to “pimp” a ’65 Chevy Impala on an upcoming episode of MTV’s hit show Pimp My Ride. Schwarzenegger, Mad Mike and the crew of Pimp My Ride give the Impala an ecological make over on the show’s season premiere, which takes place on Earth Day (Apr. 22). 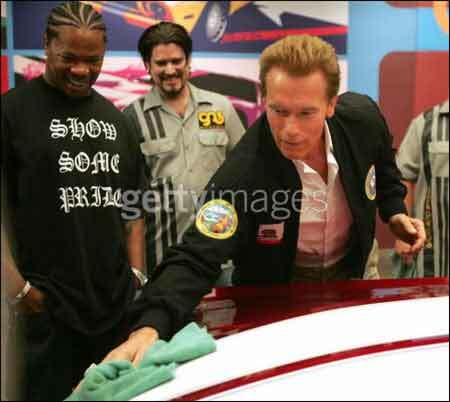 “I would like to thank MTV and the entire Pimp My Ride crew for shining the spotlight on the importance of alternative fuels and the fight against global warming,” Governor Schwarzenegger said in a statement. “I am very encouraged by the great potential in converting vehicles to run on biodiesel as a way to reduce greenhouse gas emissions,” said Governor Schwarzenegger. “I am pleased that the power of MTV’s message will reach an audience throughout California and the nation to reinforce the benefits of alternative-fuel vehicles and protecting our environment.” The special edition features the Impala getting an 800 horsepower Duramax diesel engine that will run on biodiesel fuel, educating viewers during the show about the benefits of ecological friendly cars. “What better way to celebrate the anniversary of our Break the Addiction campaign than pimping the environment with a pro like Governor Schwarzenegger – a powerful voice in the fight against climate change,” added Christina Norman, President, MTV. “During the past year, we’ve reached millions, giving our audience the tools they want to make changes in their own lives. The state of our environment is one of the most critical issues facing our audience today and we’re honored that we can inspire and educate even more as we celebrate Earth Day with this special Pimp My Ride event.” Pimp My Ride premieres Apr. 22, on Earth Day. 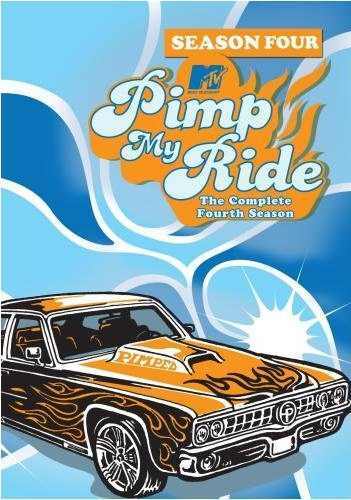 The MTV series, Pimp My Ride-The Complete First Season is now available on DVD. The three disc set includes all of the episodes from the first season of the surprise MTV hit series which stars rapper Xzibit. The box set comes in a bright neon green box, as seen above. The individual discs are enclosed in their own plastic keepsake cases. There are a total of 15 pimped out rides included in the box set and a nice selection of special features. It’s not hard to forget the very first episode of Pimp My Ride, Wyatts 1988 Daihatsu Hi-Jet. Not only were Wyatt and Xzibit from two totally different worlds it seemed, X and the crew at West Coast Customs totally pimped the Hi-Jet. The episodes themselves are pretty much the same. Xzibit suprises a young Southern California male or female who appears to be under twenty five years old and attempts to drive their raggedy car to West Coast Customs. Next we see the staff of West Coast Customs sit down in a meeting (a rep from the company said in FHM magazine that the meeting is strictly for the camera), and they determine just what tricked out things they are going to do to the car. So essentially, it is a total car makeover with special additions like shoe racks, e-mail hook-ups, video game systems, camera, video moniters and other hi tech additions. The special features are interesting for the Pimp My Ride fan. Disc three includes the special features, which are as follows: -Deleted scenes (not too much here, just a few little out takes that include Xzibit and the staff of West Coast Customs clowning around) -Bloopers -The staff of West Coast Customs and the kids who have their rides pimped flub on lines. -Exclusive car Tour featuring Travis Barker (Blink 182) and his 1954 Cadilac Coup DeVille- (this is a nice little featurette. Travis and all of his tattoos explain to Xzibit just what he did to make his Caddy look nice and smooth, down to the two tone paint. -What We Drive featurette-We see Q’s motorcycle, Gary’s hot BMW and Mikes motor home or some kind of live in coach home that is circa 1978. -Xzibit Music Video-“What You See It What You Get.” Pimp My Ride season one is a great purchase for someone who loves the shows, like Xzibit or for the car fan. Set also includes an insert to purchase “Pimp My Ride” clothes, Scarves, car mats, shot glasses and other personalized materials. 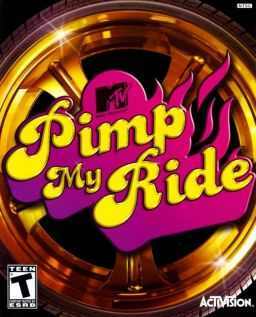 Product Review – Pimp My Ride [PlayStation 2, XBox 360 Game] Developed by Eutechnyx, Limited – Activision (2006) Pimp My Ride invites you to become a member of a car customization team in a game based on the MTV television show. You must go against rival gear-heads to win each challenge by producing the best car. Help Xzibit “Pimp” various rides by first selecting and greeting a customer. 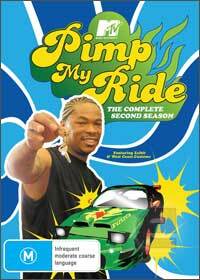 After the pleasantries, Xzibit brings the car to the shop where the pimping begins. Before any upgrades are added, you must allocate the funds by completing “Hot Stepper,” “Ghost Rider,” and “Cruise” events found around the city. After you reach your cash goal, you can begin visiting suppliers for the required tricked-out gear. You have the opportunity to improve a car’s rims, tires, body, pain, interior, and entertainment system. At the reveal stage, the customer chooses from the two cars created by you and your competition. Ever dream of riding in a blinged-out Pimp Mobile? For the lucky participants of PIMP MY RIDE, this dream becomes a reality when MTV joins forces with experienced car-detailers in order to transform the most modest of wheels into deluxe hip-hop machines. Experience the transformations that made the show such a hit in PIMP MY RIDE – SERIES 2. 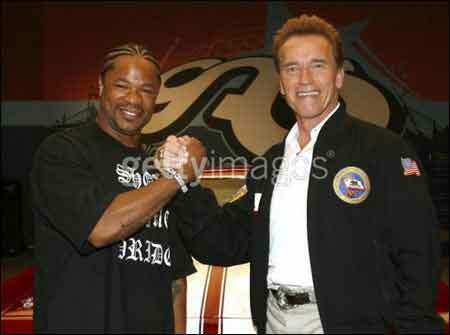 West coast rapper Xzibit hosts each 30 minute episode, all of which take place in Southern California. Working with car manufacturers West Coast Customs, Xzibit guides viewers through the process of turning dingy old vehicles into customized, tricked-out works of art. 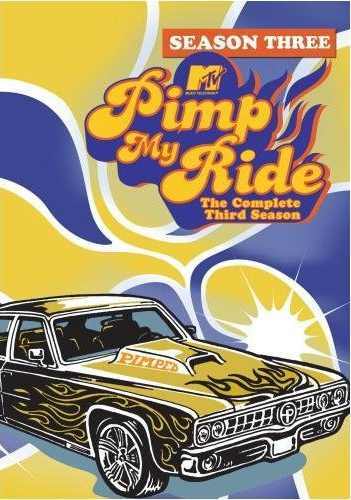 Product Review – Pimp My Ride Season One DVD The MTV series, Pimp My Ride-The Complete First Season is now available on DVD. The three disc set includes all of the episodes from the first season of the surprise MTV hit series which stars rapper Xzibit. The box set comes in a bright neon green box, as seen above. The individual discs are enclosed in their own plastic keepsake cases. There are a total of 15 pimped out rides included in the box set and a nice selection of special features. It’s not hard to forget the very first episode of Pimp My Ride, Wyatts 1988 Daihatsu Hi-Jet. Not only were Wyatt and Xzibit from two totally different worlds it seemed, X and the crew at West Coast Customs totally pimped the Hi-Jet. The episodes themselves are pretty much the same. Xzibit suprises a young Southern California male or female who appears to be under twenty five years old and attempts to drive their raggedy car to West Coast Customs. Next we see the staff of West Coast Customs sit down in a meeting (a rep from the company said in FHM magazine that the meeting is strictly for the camera), and they determine just what tricked out things they are going to do to the car. So essentially, it is a total car makeover with special additions like shoe racks, e-mail hook-ups, video game systems, camera, video moniters and other hi tech additions. The special features are interesting for the Pimp My Ride fan. Disc three includes the special features, which are as follows: -Deleted scenes (not too much here, just a few little out takes that include Xzibit and the staff of West Coast Customs clowning around) -Bloopers -The staff of West Coast Customs and the kids who have their rides pimped flub on lines. -Exclusive car Tour featuring Travis Barker (Blink 182) and his 1954 Cadilac Coup DeVille- (this is a nice little featurette. Travis and all of his tattoos explain to Xzibit just what he did to make his Caddy look nice and smooth, down to the two tone paint. -What We Drive featurette-We see Q’s motorcycle, Gary’s hot BMW and Mikes motor home or some kind of live in coach home that is circa 1978. -Xzibit Music Video-“What You See It What You Get.” Pimp My Ride season one is a great purchase for someone who loves the shows, like Xzibit or for the car fan. Set also includes an insert to purchase “Pimp My Ride” clothes , car mats, shot glasses and other personalized materials. It would be great ic you could pimp my ride fir me please . I love the show , Pimp My Ride. I have a 1988 Chevy Camero IRock Z28 that seriously need help. It’s a classic sports car that’s rarely seen. It would be a blessing to see what West Coast Customes could do to it. I live in Iowa (Cedar Rapids) but from Chicago. I work for Fed Ex (Ground) but live from pay check to pay check and can’t afford the repairs to fix it up. I’m not going to do anything crazy to pay for repairs, I’m 50 years old and would love to work with you guys with repairs. My car is the complete definition of a bucket I would love for Xzibit to pimp out my ride I will be the only pimped-out ride that’s a single mom a soccer player mom that does our kids that does our sun and all this friend should I say I would love for you to come by my crazy but I would so appreciate it and I will be the coolest soccer ball mom you’re ever seen!!! !